There are three ways to earn a horse’s respect and get him to use the thinking side of his brain. You can move his feet forwards, backwards, left and right and reward the slightest try, redirect his movement or you can inhibit his movement (take his legs away from him). As a prey animal, a horse’s legs are the most important things in the world to him because without them he can’t run from predators. If you show your horse that you can take his legs away from him without harming him, you’ll strengthen your relationship and build his trust in you as a confident leader. 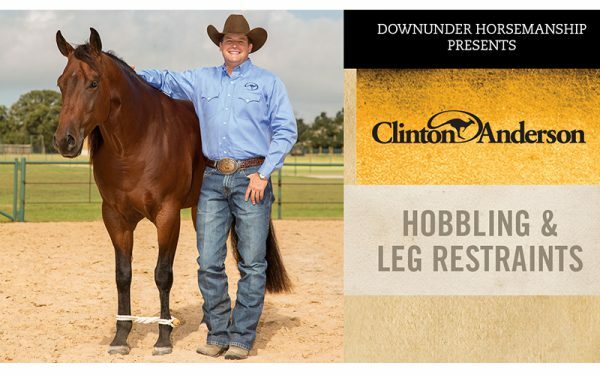 In this series, Clinton works with three horses to show you how to teach your horse to accept leg restraints with his panic-free hobbling lessons.